During my days as a university student, I found myself in the shoes of a local student and an international student. That is, I possessed both the traits of the average Australian student and overseas student. And at times this was a tad frustrating, as I will soon explain. Fact is, I am an Australian of Chinese ethnicity. I was brought up in metropolitan and suburbian Melbourne, paid Australian tertiary student fees and I speak the country’s language English fluently, and by right I was a local student and nothing more at university. However, I have also spent some time in South-East Asia in my teens, mingling with people of different races and immersing myself in the region’s different cultures – and this rubbed off a fair bit on my personality, making me seem like a foreigner to quite a few in Australia today. A few months ago, I attended Australia’s inaugural First Generation of Multicultural Australians and International Students Symposium. The symposium fleshed out the typical yet contrasting characteristics and behaviours often exhibited by local and international students. Reflecting on what I learnt at the symposium, I realised I fit both the moulds of local student and international student when I was at university – which is not really surprising given my status as a TCK – according to these definers or more simply markers that can be used to distinguish the former group of students from the other and vice-versa. For someone who is Australian, I do not have an Australian accent. My classmates would frequently hear a slight hint of a South-East Asian (SEA) accent when I chatted with them in between tutorials and occasionally my speech was peppered with colloquial words from SEA countries, making me seem like an overseas student. English is spoken differently in countries where international students are from compared to Australia due to varying English fluency levels in these places, and it is no surprise that ‘foreign-sounding speech’ is a distinct characteristic of this group of students. Personally, the annoying – and also amusing – thing about being a local student with a slight foreign accent is the second my classmates heard words coming out of my mouth, they usually asked, “Where are you from?”. I constantly, emphatically responded “Australia”. My classmates always found this hard to believe and the more stubborn ones even had to gall to insist I was a foreigner despite my protests. Given that I like my privacy and am not a huge fan of spewing my back-story ninety-nine percent of the time, I always had to reluctantly go to some length, lay out my travel stories for them to hear, to set the record straight. Unlike quite a number of international students who have not resided in Melbourne for an extended period of time, I know my way around this city very well from having lived more than half my life here. I know how the local transport system works, which restaurants serve a good mouth-watering feed and have been to quite a few tourist spots around the state (think St. Kilda Beach and strawberry picking farms). 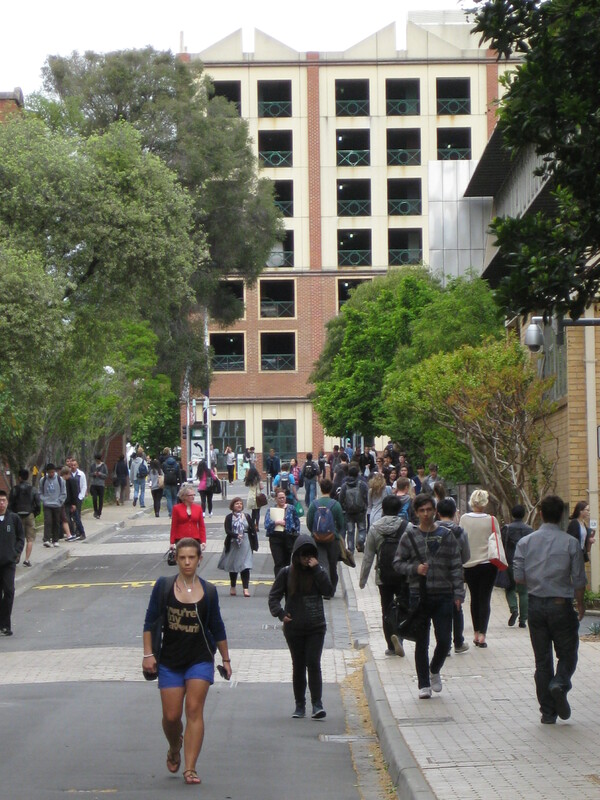 Part of student life or ‘the student experience’ includes traveling to places around campus or within its vicinity especially for international students. During my university days I constantly played their so-called local tour-guide. It is expected of overseas students to check out scenic sights and attractions Australia has to offer – they have traveled far Down Under for an education, and why not seize the opportunity to have some touristy fun as well? Whenever I mentioned that I am an Aussie resident, time and time again international students assumed I was an excellent person for directions and would ask me questions along the lines of, ‘Have you been to this pho place in Richmond?’. A couple even asked if I owned a car, subtly hinting at the prospect of going on trips around the state with me as their designated driver. Often, I gladly shared what I knew geographically about Melbourne and tried not to think of overseas students’ sneaky attempts at taking advantage of my motor vehicle, all the while feeling the furthest from being in their shoes and more like an Australian student rightly equipped with local street-smarts. I did not have ‘international student dilemmas’ during my student days and in this sense, I was more a cushy local student. I was lucky enough to live at home, avoid cramped housing conditions and did not have to slave away at multiple minimum wage casual jobs to pay off abhorrent amounts of course fees like the average international student. As much as I wanted to listen or help international students with their problems, this was usually not possible and I felt a slight hostile distance between us. Whenever I broached these topics with them, they shied away from sharing their problems with me and went all quiet. Often, I saw that they preferred to talk about their problems with other foreign students who have been through similar situations or were in the same boat as them. Their mentality was, “Why talk to local students about this when they don’t know what I’m going through?”. Which in itself is a very valid point. I never did warm towards many social activities popular with Australian students on-campus. I never was a huge fan of sporting events or pub crawls put together by the extra-curricular clubs at university, just because they did not interest me personally. Instead, many activities that were of interest to many Asian international students piqued my attention. I was always drawn to and attended Asian multicultural fiestas and celebrations on campus, dazzled by the exotic dances and colourful, scrumptious Chinese/Japanese/Malaysian food on offer while forgetting about my Australian roots for more than a split second. This was probably because I am Chinese and was brought up with Chinese/Asian values, and activities that had an Asian twist to them was aligned with my interests, right-up my alley. On a sour note, most of the time I mingled with students from China or Malaysia at these social events and never really got the chance to hear what local students thought of on-campus heart-warming ethnic festivities. But that is not to say Aussie students do not attend these gatherings. Students of diverse backgrounds at The University of Melbourne. I asked myself several questions during my early university days as a TCK. Where do I fit in? I do not speak entirely with an Australian accent and do not like to get involved in activities popular with the locals, so am I rightfully a local student? Should I just call myself an international student and save my breath monotonously explaining how I’m actually not? After several concurrent semesters at university, I met quite a number of Australian students of ethnic background and even international students who proudly associated themselves with a mish-mash of cultures and experiences. They had either traveled the world and acquainted themselves with new cultures or were keen on maintaining their traditional customs, sometimes both. It was then that I began confidently calling myself an Australian student, an Australian student who wears myriad cultures that are close to her heart on her sleeve – my own person. In a globalised world where movement and travel is the norm, many Australians, local students and people in general have different backgrounds, religions, personalities and tastes. The latest Census results show almost one in four Australians are born overseas and 43.1 per cent of Australians have at least one parent who migrated here. More and more of us in the land Down Under are affiliated with a smattering of cultures. I realised being a TCK who had the attributes of a local and international student during my student days was not so bad after all and it had its benefits. No matter how much I dislike it, the question “Where are you from?” was always a conversation starter with both Australian and overseas students. When I began responding humourously to this question – “I’m from Earth. Same place as you” – my classmates, tickled by my warm wit, would laugh and the conversation would naturally flow from there. Beginnings of friendship. My hint of a foreign accent somehow made me an amicable character and because of this I was able to mingle with almost everyone at university. Local students, many whom were aspiring globetrotters, would point out my accent and this always led to camaraderic discussions about traveling overseas and around Melbourne’s suburbs. International students from Asia felt I was approachable as my “foreign speech” reminded them of home; they were always eager to include me in their activities as I was literally ‘one of them’, and some eventually shared their problems with me after knowing me for some time. In turn, I often discovered more about their traditions and learnt to see things from various cultural perspectives. As for the stubborn people who insisted I was not a local student? I accepted it as part and parcel of a TCK’s student life. There are always bound to be negatives – and positives – for a student caught in between different cultures and from memory, the negatives only bothered me for a few fleeting minutes. And as they say, it is just a matter of taking the good times with the bad. This entry was posted in Asian Australian, Identity, Multiculturalism, Racism and tagged Asian, life, lifestyle, people, student by Mabel Kwong. Bookmark the permalink. I have some experiences of being questioned about my identity. Despite my Australian accent and being an Australian-Born Chinese, some people still think I am born overseas (this may be due to my non-Anglo name). But I proudly tell them that I am Australian-Born Chinese and I am very proud of my name. Thank you for your support and glad you liked the post! Accepting the one’s different identities and experiences is definitely nothing to be ashamed of! As you said and as I mentioned in my post, it equips one with diverse perspectives. Good to hear that you are proud of being Australian and very proud of your name. You too are unique and your heritage – and Chinese name – makes you an interesting and special person. I’m getting shivers down my spine reading this. You have captured experiences similar to mine, and those I know including my wife. She is Korean studying in Australia, on spouse visa. Paying international fees, but effectively domestic student otherwise. Keep the posts up! And thank you for writing so well. Thank you for the nice words! This article was a story that I’ve wanted to tell for a long time. There are so many intriguing experiences that you encounter as a person from a complex background with multiple identities. To get the most out of it, I believe you should just shrug off the bad experiences and enjoy the good ones! More posts to come in the near future! What a strong first blog post, Mabel. I hope some of your long-term visitors got a chance to read this one. I think you touched upon an issue that’s universal to people regardless of gender, ethnicity, and culture… and that’s the whole subject of how we “fit in.” We all long to belong to something or someone, and sometimes it takes us a while before we figure out just HOW and WHERE we belong. Thanks, Chris. Thanks for reading this one – it’s post very different from what I post about now…but nonetheless a post close to my heart. The whole idea of “belonging” is very broad. There’s so many places to “belong” – within our family, circle of friends, work, our partner, the broader (Asian community), to name a few. Very good point: HOW and WHERE we belong. They are two different things. It’s always hard to feel comfortable in a place or space when the others around you shun you and don’t take you seriously – that’s out of our control. You are so correct when you say Asian Australians are barely mentioned in Australian society – in Australian media, politics, art, the top of the corporate ladder, the list goes on. On the subject of local media, the occasional times when Asian Australians get a mention these days in the news is when we’re splashing out our cash purchasing properties or doing very well in the Year 12 exams. When we don’t see other Asian Australian faces in facets of Australian society, we don’t just feel confused, but we feel like we’re invisible too. Hope you’ve settled down in Australia, it sounds like you have made this country your home and are confident hanging around with those around you. “I still have a lot of questions about myself”. I feel the same way often. Even if people around us are accepting of who we are (which isn’t usually the case), we may not be accepting of ourselves – there is the (eternal) struggle within us to feel fully Asian AND Australian at the same time. It’s probably an impossible feat to feel either, maybe we should give up. But then again, connecting with our culture(s) is the way we make sense of ourselves. I hope to write more about being Asian Australian in the near future, on this blog…and in my book about being Asian in Australia too. A topic that needs tot be addressed.